Black and white image of two women and three children. One of the women leans against an older model car, while the other stands next to her. Both wear dresses. A little girl in a dress stands between them, while two older boys stand on either side of the group. 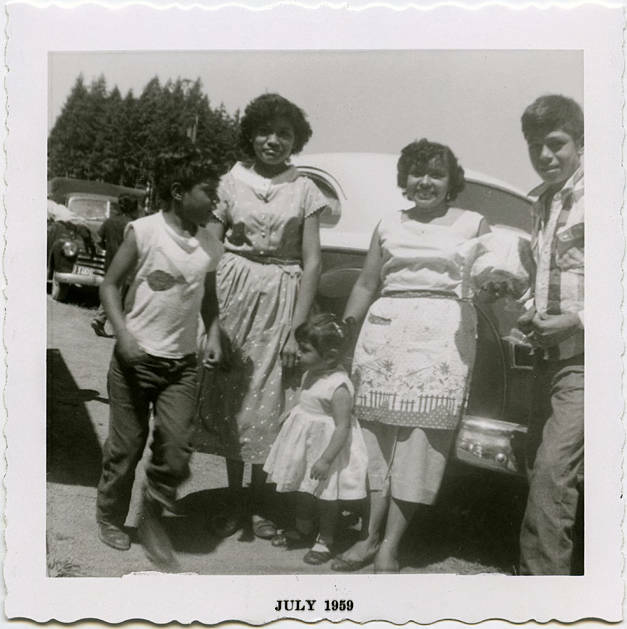 Printed on the bottom of the photograph are the words 'July 1959.' Museum records identify the people in the image as members of a group of 'potato pickers,' most likely migrant workers. Migrant farm labor has been an important part of agriculture in Washington County since the early 1900s, though the cultural groups which provide the majority of the laborers have changed over time.